75410 2" Wide Tape Gun with 2 Rolls 2" x 55 yrds Ergonomic design for comfort Durable for long-lasting use These tape guns are durable. The dispensers feature an ergonomic design. These tape guns have a cushioned foam grip. The dispensers contain a smoothing roller. 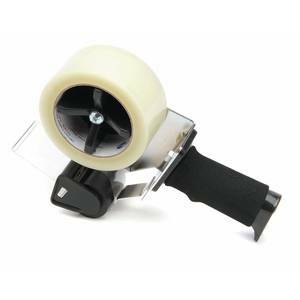 These tape guns feature an angled blade for extra comfort in use.